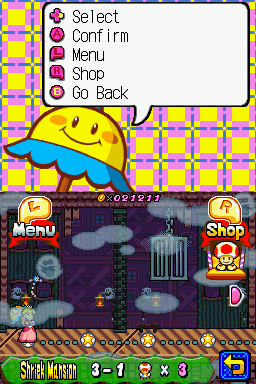 Shriek Mansion is the third area of Vibe Island in the game Super Princess Peach where King Boo can be found as the boss. 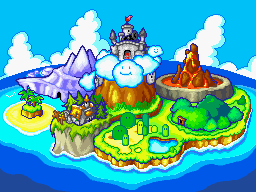 The world is a big Ghost House which contains Boos, Fishing Boos, Big Boos and many more ghost-themed creatures. Hyūdoro Yashiki 「屋敷」 yashiki means "mansion", 「ヒュー」 hyū is an onomatopoeia for whooshing or whistling wind, and 「ドロ」 doro represents muddiness or dripping mud; the overall message is that the mansion is a spooky, unsettling place.